For the cost of a few packets of seeds you can maintain a steady flow of fresh vegetables and flowers all year round with the help of your Access Mini-greenhouse or frame. We trust this guide will help you get the most from your sound investment in an Access product. 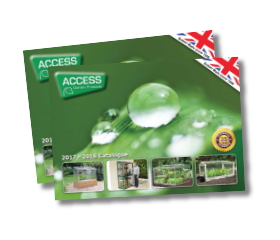 We have been using Access Cold Frames at Crick for about 50 years originally on a commercial and now on a home garden scale, and know you will get years of gardening pleasure from your purchase. Everyone worries about aspect but in reality, whaterver direction you Mini greenhouse faces, there are plenty of crops and plants that will thrive. North – Ideal for decorative foliage and shade loving plants. Also suitable for bringing on seedlings and plug plants provided there is reasonable ambient light. Salad crops planted in the Summer also benefit from the shade that a North facing aspect provides. South – Provides the maximum sunshine and warmth, making it ideal for tomatoes and peppers. Use automatic ventilation with the Access shade cover to keep plants cool in high Summer. West – Ideal for a wide range of plants. Sunshine later in the day heats up back walls to give warm overnight conditions, minimising heating costs. Considered by many to be the best aspect. East – Ideal for a wide range of plants. For early morning sunshine and quick warm up, gives afternoon shading, preventing the mini greenhouse from getting too hot. The Access Mini-greenhouse need fixing to a suitable wall or fence. If the wall is uneven, then a simple timber frame on the two sides and the top should be fitted to the wall using mastic sealant to seal any gaps. A 25x50mm timber is suitable. The framework will then screw back to this. If there is a drain pipe in the way, use timber as thick as the drainpipe so that the framework fits over the pipe. If no wall is available, a false back of exterior ply can be made, supported by two stout posts and the framework screwed to this – alternatively Access can supply an optional glass back. Where there is a choice of walls, choose the sunniest. If necessary ‘white wash’ the wall to increase reflected light. To fit to a fence, either purchase an optional glass back or screw the mini greenhouse to an exterior ply backboard. Fix the backboard to the fence in a few places to keep it firm. The ground should be firm and ideally if the greenhouse isn’t being fixed back to a wall, it should be screwed down to slabs or concrete instead. On soil, lay a line of paving slabs and stand the Mini-greenhouse bottom rail on the edge of the slabs so they form a path in front, or slab the area totally. For more advice, check out our fixing tips page. Ventilation is very simple with top and front sheets sliding for ventilation. The shelving can be removed at any time where extra headroom is required or folded flat against the back. In 1.5m and 2m long models the shelving is supplied in two sections so that one can fold back or remove a half length of shelving if required. If supplied with the automatic louvre vent, this should be placed on the sunniest end, in place of the upper end sheet. A Heat Mat turns the Mini-greenhouse into an ideal propagator. Place on the floor on a layer of polystyrene and plug into the mains. The probe thermostat is fully adjustable. Access garden products supply a range of heaters – electrical or paraffin to increase the range of crops which can be grown and over-wintered. Because the volume of air is very small, heating is not expensive. For extra winter insulation, we recommend the Access Shade Cover which clips to the roof. Bubble film can be fixed to the ends – the shelves should hold it in position. This leaves the front free for access. The watering needs only to be on for a few minutes. Access supply a battery operated timer that will automate your watering. All Access Garden Frames are designed to stand on soil, gravel or a patio. If your frame is being used in one position, with plants growing in the soil, you can make a path of paving slabs round the frame, and rest the frame kick rails on the edges of the slabs. However, the great feature of an Access frame is that it can be moved from site to site in the larger garden. The glass is readily removed, and the framework only weighs a few kilos. Many models can be moved complete with glass by two people. Lift wider models by the top end legs – grip near the side rails. Unshaded positions are to be preferred for maximum growth. The wider models are ideal for raised bed growing. This system ensures that the beds are not trampled on. Up to 1.2m (4’) is an ideal bed width. For soil-grown crops, organic matter in the soil is essential to get the most from your frame. Well rotted manure, compost or peat should be forked into the chosen frame site in the autumn. Fish manure, hoof and horn, or compound fertiliser can also be added at about 65-130 gms per m2 (2-4 ozs. per sq. yd.) 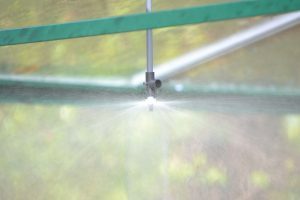 Before growing or planting, make sure the soil is adequately moistened – where fitted the Access mist watering is ideal. Put the frame in position 7 – 10 days before planting or sowing, to warm up the soil. Adequate watering is important for vigorous crops. The Access mist watering makes watering a simple, turn-of-the-tap task. The snap-on hose fittings enable a length of hose to be attached to the Access fitting, and disconnected when finished. We recommend foliar feeding with Maxicrop during the summer – this also helps to keep down pests. Many greenhouse owners put their frame inside their greenhouse in the winter with an Access Heat Mat to make an ideal propagator which can be moved outside in the spring for hardening off, leaving the greenhouse clear for summer crops. If not fitted with the Automatic Louvre vent simply slide sheets of glass to allow ventilation. In the spring, open the front bottom sheets [side sheet] 2-8 cms (1-3 ins). As the weather gets warmer, the upper front [top] sheets are also opened. Finally for maximum ventilation the top sheets can be opened or removed. In hot weather end [side] sheets can be replaced with panels of wire netting to keep the birds out. The turn of the tap watering simplifies the job! If all the shelves are packed some hand watering may be necessary. Only open the tap a chink as little volume of water is necessary. It does however need the pressure from the mains – it will not work from a gravity tank. Watering can be easily automated! The Access battery timer screws onto your tap and will operate the watering up to 4 times a day, everyday or on whatever days you choose. The fully adjustable ventilation and the Access watering system enable you to harden off and water perfectly. Many gardeners use their Access in conjunction with a greenhouse. The Access Shade Cover[s] clip to the roof and give 50% shade, which is ideal. When not required, simply unclip at the front and roll them up. Each Autumn, remove each sheet of glass. Clean with warm soapy water using say a car wash brush, rinse well. Wet glass can be slippery – take care! Don’t let the edges of the glass get knocked. Toughened glass should be rested on timber rather than concrete when not in the frame. Wash all the framework. Rub a candle on the black and the white tapes in the channels and also on the aluminium lips on which the tops sheets slide. This gives very smooth sliding! Winter – Most will be using their Lean-to for winter protection of tender plants. To accommodate tall plants such as standard fushias remove or slide across as many middle staging sheets as necessary. Insulate the frame. If you have no heating, wrap individual plants and their pots in bubble film for extra insulation. Spring – Sow seeds either in the warm or in the Mini-greenhouse and prick out and grow on in the Mini-greenhouse. With an Access Heat Mat one can start seed raising really early, to give good sized plants for bedding out. Cuttings can also be rooted using the Heat Mat. Tomato plants can be planted out into grow bag(s) on floor and can grow up for several weeks before the middle staging sheets need removing. You can still be hardening off your plants while the tomatoes are growing. Put 2 plants in a 1m; 3 in a 1.5m and 4 in an 2m. Use bush varieties if you have a Lean-to Frame. 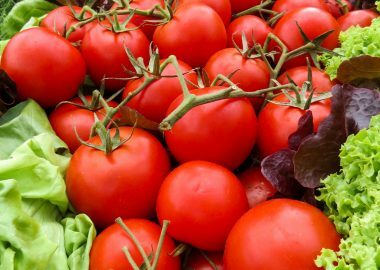 Summer – Tomatoes! Alternative crops are melons, cucumbers, peppers. Autumn – Most will be preparing for the winter. There are many bulbs that can be started in the autumn. Lettuce, parsley make good winter salads. Peas, broad beans, runner beans and marrows can be started off for planting out in the garden later. This gains several weeks, and ensures good germination. Sow direct in the soil, or in pots or seed trays filled with seed compost. Give good ventilation a week or two before planting out. Generally you can plant out at the same time that seeds would be sown outside. (For tender plants like marrows and runner beans, only plant out when danger of frost is past). Annual flowers for bedding can be started in this way, and brussels sprouts, leeks and cabbage given an early start. Providing the soil is good and there is adequate water, cropping can be very intensive. Often one crop can be planted between two rows of another – lettuce between beans, peas or carrots, for example; in one corner a patch of parsley can be sown, or in a short row of radish. With planning (and experience!) every square inch of the frame can be put to work. Keen exhibitors recognise the need for protection to grow the best possible specimens. Many of the top prizes are won by users of ACCESS frames. You will be able to plant out earlier and grow more rapidly with the protection ACCESS provides. The vertical sides of the frame ensure extra growing room, and the precise control of ventilation ensures top quality plants.